I found Tilt’s Bush in Doon and it is fabulously natural, has a short gravel trail into the bush. Then its just bush in hills and you can see why this area was first called Sandhills. Can see this element in some of Homer’s paintings. The old trees were easier to see as much of the leaves were gone, allowing you see well into the bush. Great fir trees. This bush is surrounded by new housing developments. They sure made ugly houses out here, over and over again. Beige is my new to-do. Another to-do is to paint the chickens at Tilt’s farm – brown ones and black ones. This painting was the day after the first snow. The weeds were holding aloft the fine snow that had fallen on their seed heads, wind, a bit of blue sky and trees. 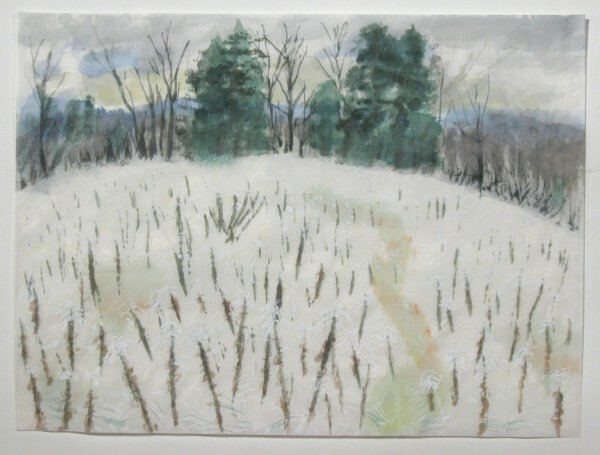 You could see white and green stripes on the ground that were the grasses under a layer of snow. Isabella, thanks for some of the thinnest washi yet. Painting during October was very comfortable. No mosquitos at last.The fall colours were fantasitic as always. I spent a Sunday in Steckle Woods and this was one from that day. Had a few from this series at Tri-City Stopgap exhibition in Kitchener. 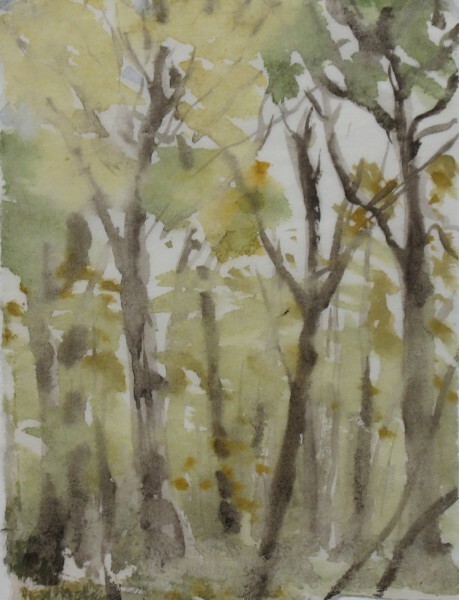 Tags: Doon, Homer Watson, Kitchener, painting, Steckle Woods, Tilt's Bush, washi, watercolour | Permalink.